The Orlando Cubs needed a hit and pinch hitter Darryl Vice came through - with a home run. Vice's eighth inning shot in this May 1993 game plated three runs and sent his AA team on to a 6-4 win, The Orlando Sentinel wrote. That home run was one of three Vice hit for Orlando that year, his fifth pro season. It was also his last pro season. Vice never made the majors. Vice's career began in 1989, taken by the Athletics in the 16th round out of the University of California, Berkeley. At Berkeley, Vice had four hits in a May 1987 game. He stole 89 bases over his career there, good for sixth all-time at the school. He won all-conference honors in 1987 and 1989. Vice started his career at single-A Modesto. He hit just .184 in 78 games. He played 1990 between Modesto and single-A Madison. He also got into seven games at AAA Tacoma. He hit .260 between the three levels, with three home runs. He played 1991 at AA Huntsville. The infielder hit .244 in 97 games. He stole home in an April game. He returned to Huntsville for 1992, hitting a career-best .295. He had three hits in a June game. 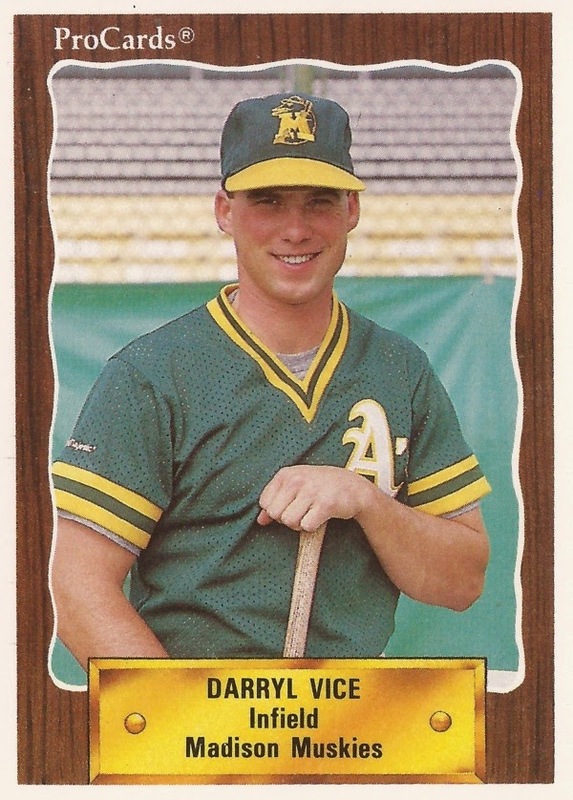 Vice moved to the Cubs system for 1993, playing at AA Orlando. He hit .273 in 62 games. It was his final season as a pro. Vice has gone on to work as a teacher and in real estate. He's also coached in high school. In 2013, he spoke with The Santa Rosa Press Democrat about one of the players he'd coached named Justin Fitzgerald. "The one thing Justin had to work on the most," Vice told The Press Democrat, "was his composure. He had to control his emotions. He was 6-foot-5, had good mechanics, good control and good stuff. But you need to forget that last pitch and concentrate completely on the next. It's what separates the pitchers who make it from the ones who don't."